Last week, popular ‘live DJ’ streaming music site Turntable.fm announced it would be shutting down the service today to pivot the company toward the more profitable Turntable Live platform. Long story short, Turntable.fm inked a deal in 2012 with the major labels that was also their death sentence. At the time, the service was surfing the murky seas of the DMCA safe harbor clause, the doctrine that essentially allows digital services that facilitate copyright infringement stay online, as long as they aren’t party to the infringement, have substantial non-infringing uses, and respond to DMCA takedown notices. Many thought the RIAA would sue Turntable.fm out of existence as it did many companies before it, but the March 2012 deal saw Turntable.fm agree to the licensing terms of the major labels. As the latest casualty of the majority stakeholders of the music industry, Turntable.fm had no choice but to pivot to a different service. 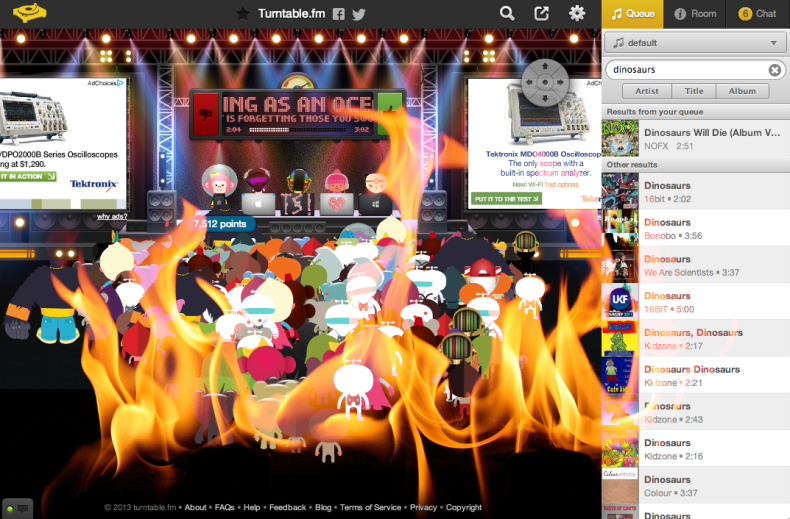 While we will dearly miss Turntable.fm, we are encouraged by their new Turntable Live platform. Turntable Live competes directly with Soundhalo and Stageit in the virtual live performance space. At first glance, we see great potential in Turntable Live, with what look to be some nice features to boost fan interaction during the live stream. We’ll update you with a full review soon. For now, we mourn the passing of another great music service killed by the global music oligopoly.